Lilywhites boss Stephen Kenny and Gary Rogers both know what it takes to win the FAI Cup final. 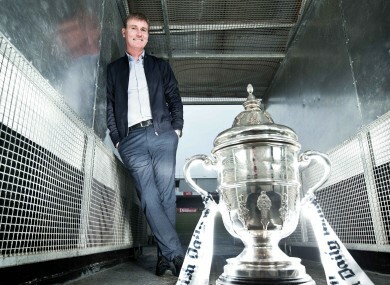 Kenny alongside the cup at Oriel Park during the week. DUNDALK MANAGER STEPHEN Kenny admits even he was surprised at just how dominant his team were in retaining the SSE Airtricity League Premier Division. While the title was secured with three weeks to go, Richie Towell’s second of the night in Friday’s 4-0 win over Bray Wanderers ensured they broke the record for most goals scored in a season with 78 — the same number as their points tally. “We know from the history of football in Ireland that Dundalk have never been able to retain it,” Kenny, speaking ahead of tomorrow’s FAI Cup final, told The42. “It has proved so elusive for provincial teams so we knew we would have a real challenge. “We could never have envisaged winning it with three games to spare. If someone had said at the start of the season that we would score more goals than any other team in the history, I wouldn’t have believed them. The partying in Dundalk didn’t last long as attentions quickly turned to another major piece of silverware. It is 13 years since the Lilywhites tasted success in the FAI Cup and you have to go back as far as 1988 to find the last time they won it as part of a league and cup double. The significance isn’t lost on Dubliner Kenny, who is three years at the club this month. “It’s an absolute honour to be involved in occasions like this and we can’t take it for granted,” he says. “The buzz in Dundalk the moment is great but it hasn’t always been the case with League of Ireland clubs. It’s hard to generate interest but that’s not the case here right now and everybody is wishing you well. “Cork will be determined about the cup and we are the same so something has to give. It will be a brilliant occasion, the whole town here will empty out. While it may the 44-year-old’s first FAI Cup final with Dundalk, he can call upon past experiences with Derry City. During his first spell with the Candystripes, they were on the right side of a seven-goal thriller with St Patrick’s Athletic in 2006, which was won in extra-time and has since been voted the greatest ever FAI Cup final by fans. Two years later, 120 minutes were again needed but this time Derry went down 4-2 to Bohemians at the RDS. Captain Stephen O’Donnell is a doubt for the final after picking up a groin injury last week, but Dundalk player who has lifted the coveted trophy, Gary Rogers, will surely start. An unused substitute in the 2005 final, the vastly-experienced goalkeeper was named between the posts when Sligo Rovers faced Drogheda United two years ago — when a thoroughly entertaining spectacle ended in 3-2 victory for the Bit O’Red. “I remember it being a fairly frantic second half,” Rogers recalls. “We didn’t know whether we were going to win or lose or if it was going to go to extra time. Dundalk’s first signing of the close season 12 months ago, the 34-year-old has slotted in seamlessly to become a vital part of the Premier Division’s meanest defence. “It has been terrific since the start of the year and I couldn’t have asked for much more,” he says. “To win the league and be looking forward to the cup final, you can’t get much better than that so it has all gone really well. “The gaffer played me with the back four for most of the pre-season so we could build up that relationship you need. “When you can get your back four or five playing together regularly and you keep everyone fit it does help you. You look at all the league winning teams and they tend to have really strong defences. “That solidity provides the foundation for the attacking players to go on and win us the game. The former Drogheda United, Galway United, St Patrick’s Athletic and Sligo Rovers stopper has won it all in the League of Ireland, yet it will be a first for the Bohermeen native if Dundalk prevail this afternoon. Email “'An absolute honour to be involved in occasions like this' - Dreams of the double drive Dundalk”. Feedback on “'An absolute honour to be involved in occasions like this' - Dreams of the double drive Dundalk”.